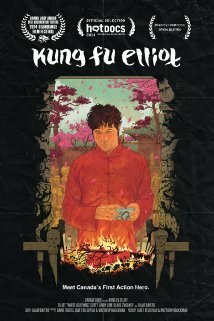 NZIFF Auckland 2014 – Kung Fu Elliot (Matthew Bauckman, Jaret Belliveau, 2014) | Shut Up Hamish! Kung Fu Elliot (Matthew Bauckman, Jaret Belliveau), compared to Big Men that I discuss in the post below, provided an interesting opposite example of how to make a documentary. Either the filmmakers got perhaps a little too involved in their subject or the authenticity of the film itself is up for doubt. Elliot ‘White Lightening’ Scott plans to become the first Canadian Kung Fu film star, shooting no-budget short films on a consumer point-and-shoot camera, doing all his own stunts with the help of his supportive partner Linda. The filmmakers follow him around over two years as he attempts to finish his 2nd film, Blood Fight. His Kung Fu is dubious at best, as is the acting and stunts which he attempts, and yet he has an enduring belief in his talent. During the course of the film, the stories Elliot tells about his life and achievements begin to unravel. Linda waits patiently for a ring to make their engagement legitimate. Elliot continues to delay. The production of his third film, Blood Fight, continues to be delayed as well. During all this, Elliot’s commitment to his partner becomes doubtful, as the filmmakers document his increasingly suspicious behaviour. That is if we are to believe the film is a real documentary. Elliot could very well be a mockumentary that hasn’t been outed as one yet — I’m doing a little bit of social networking research on this topic and the real Elliot does indeed have a facebook fan page, but nothing has been posted on it since 2013. I contacted the filmmakers, asking if Elliot had seen the film, to which they replied stating that neither Elliot nor Linda have seen the film, yet a few of the cast members had. So perhaps this debunks my theory, and the filmmakers practices getting that close to the subject are in my eyes questionable, or maybe they’re pulling a Cannibal Holocaust on us to get press for their partially kickstarter funded project. Not to put anyone off seeing the film. It is hilarious and a well made debut, so see it and form your own opinion, add to the discussion. It’s sure to become a cult favourite. A particular memorable scene was one in which Elliot visits an actual Shaolin monk in China, and attempts to fight a real trained Kung Fu monk. The results must be witnessed. To the filmmakers credit, they raise some interesting questions about the fantasies we build around ourselves. That is, unless the trick is on the audience, but that remains to be seen. EDIT: The filmmakers have responded further on Facebook to my questions, stating that Elliot is most definitely a real person. There’s a good vice article on the making of the film, which gives insight to show that the filmmakers were led on by Elliot’s lies and fantasies, just as much as his friends and associates were. POSTSCRIPT (23rd July): Based on this new information that Elliot and his friends are completely real people, and the insights that the filmmakers give in the above vice article, I have to say that the film has become an even more intriguing thing. It was not just Elliot’s girlfriend Linda and his friends that were lied to, but the filmmakers as well. The documentary team started this project following Elliot expecting completely innocent things; that they were following a delusional but well natured man, who desires fame as much as any of us do, but whom is prepared to build fantasies around himself to give himself a sense of achievement beyond what most people have the capability. The darker side of Elliot that slowly emerges throughout the course of the film, was something the filmmakers themselves were also unaware of and the way they have structured the documentary, we the audience become aware of this as they do. Therefore the filmmakers were not withholding as much information from their subjects as what I assumed they were, and the dramatic revealing of information that occurs throughout the last section of the film is made all the more potent by the fact it is completely real. Elliot wanted the fame, he let the documentary crew in and the exposed his life in a way that he perhaps felt the illusions he had built had made him immune to. In that way the film perhaps shows the limitations of desiring fame from many perspectives; the example here is that if you’re prepared to build very large illusions around your life, than you to should be prepared to have those illusions shattered, and to lose those people in your life that you have gained through maintaining those illusions.